Contain images that may not be eye pleasing for several users. Viewers discretion is advised. However, some people may not be a fan of this particular lip balm. There’s class lawsuit against this company product in 2016, claiming that the lip balm caused bleeding and blistering. The preliminary settlement for those affected was a reimbursement with products, cash, or more depending on their reactions to the product. Helianthus Annuus (Sunflower) Seed Oil, Beeswax/Cera Alba (Cire d’abeille), Ricinus Communis (Castor) Seed Oil, Bis-Diglyceryl Polyacyladipate-2, Jojoba Esters, Cocos Nucifera (Coconut) Oil, Oryza Sativa (Rice) Bran Wax, Helianthus Annuus (Sunflower) Seed Wax, Butyrospermum Parkii (Shea) Butter, Theobroma Cacao (Cocoa) Seed Butter, Flavour (Aroma), Acacia Decurrens Flower Wax, Stevia Rebaudiana Leaf/Stem Extract, Tocopherol, Polyglycerin-3, Glycine Soja (Soybean) Oil, Citric Acid. While my sister getting allergic, I have no reaction to EOS at all. The lip balm not even plumping my lips like EVELOM kiss mix does or even Moist but slight moist compare to Supergoop lip balm. I personally feel that the lip balm design is not making me easy to apply especially around my lips. My lips are really dry to the point that it has a dry patch around. however, since I use lip balm almost every time I feel dry in my lips. I have no longer suffering from the dry patch but when I use EOS Shea butter lip balm, it does not provide long lasting moist, so I have to re-apply every few minutes (20-25 minutes). 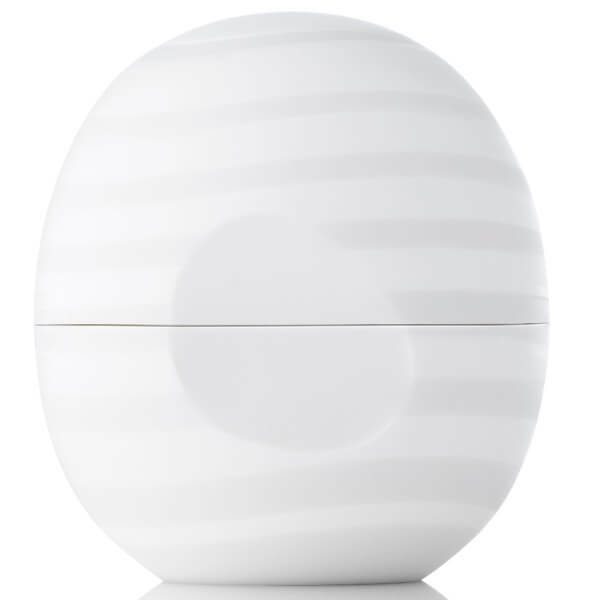 The lip balm is easy to carry around even thou it is chubby. You have to rotatethe cap in order to use it. This lip balm is not worth to buy even it is cheap. It just work as a regular lip balm and even less. If you want to buy this lip balm, you gotta make sure that you are not allergic to the ingredients contains in the lip balm. However, that alone is risky if you have no ideas that you are going to suffer from allergic. There is other lip balm that perform better and cost less than this one in the drug store such as Nivea lip balm. Even thou it different based on the ingredients, with EOS using eau de naturale ingredients while the other lip balm may use artificial ingredients but it is quite risky since eau de naturale doesn’t compromise to not having no allergic reaction at all. What do you think? Will you recommend the product? Contain images that may not be eye pleasing for several users. Viewer discretion is advised.